From the Baldwin County Courthouse, go west on Hancock St. which becomes Highway 49 and follow Highway 49 south for 4.5 miles from the Courthouse. 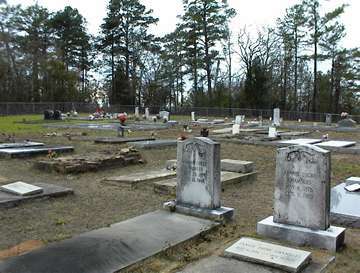 Cemetery is on the right hand side of the road (originally was the Martin Family Cemetery). First, middle names unreadable in 1999. First, middle names, per TT. w/o H.J. Bloodworth Middle initial may be E.
b. Baldwin Co, Ga. d. Wilkinson Co, Ga. Locations and service info, per RCSG. Co. G, 45th Ga Inf. Pvt Feb 12, 1864. Wounded-Sailor's Creek, Va. Apr 6, 1865. Surrendered-Appomattox, Va. Apr 9, 1865. Co. G., 45th Ga Inf. Pvt on Mar 4, 1862. Jun 22,1864. Captured in Apr 1865. "F.E" on broken piece of granite. Enlistment info per Historical Data Systems of Kingston, Ma. "Tut", Woodman of the World.